Happy new year! 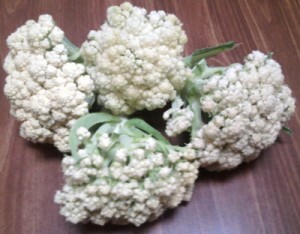 This morning I went out to the greenhouse and cut four cauliflower heads off the plants I transplanted in the fall. The plants had not bloomed all summer, but had grown about chest high, and the stalks are over an inch thick. I was not going to let those plants go to waste, so I put them in 5gal buckets and set them in the greenhouse. With the mild December weather, they continued to grow and produced heads, each about hand-sized. There are several broccoli plants in the greenhouse as well, and some cabbage. I’m going to put them back in the garden in March or April and hopefully they will produce more veggies for the late spring or summer. It will be time to plant your seedlings indoors soon. I’ll write about that in the coming weeks. It’s easy! If you’d like to build a simple greenhouse, see my article. May you have a prosperous and free 2016! Hank Wallace owns Prudent Supply, an emergency preparedness concern providing supplies, classes, and community in beautiful Botetourt County, Virginia.